Living Near the Tracks: Does Railroad Proximity Matter? You are here: Home / Texas Real Estate Reports and Local Interest Articles / Living Near the Tracks: Does Railroad Proximity Matter? Do you have rail road tracks in close proximity to your neighborhood, or more specifically, to your home? 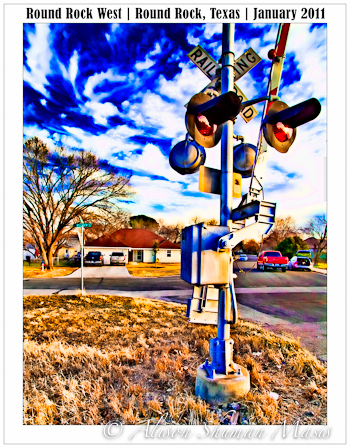 Would rail road tracks impact your decision on whether or not to buy a home in an area? We posed a similar question to the Active Rain community, a vast on-line network of real estate professionals. Responses from Realtors about their client preferences came back in two primary flavors: yes and maybe. Below, we share some observations, including our own. Trains are noisy, and do not necessarily honor sleep schedules. Many tracks aren’t fenced off, so keeping kids away from the tracks could be a problem. Some tracks can impede traffic into or out of a neighborhood, which can be a problem particularly around commute time when traffic may be backing up anyhow. Homes near tracks are exposed to more dust and grime, a by product of busy streets as well. If the tracks aren’t commuter rails (freight trains only) or a station isn’t near enough to the neighborhood to walk to, then the benefits of the commuter trains may not be experienced by all of the neighborhoods along the rail line. In Tarrytown, NY, homes near the commuter rail provide convenient access to the local station, for trains to and from New York City. This can enable families to get by with one car, if the commuter can walk to the station or the home is near enough to easily drop someone off. I lived across the bridge from Tarrytown, in Nyack, New York, and access to the station was provided by a bus across the bridge. If I had been a NYC commuter, I would have chosen Tarrytown over Nyack for that very specific reason (access to the train). In Mountain View, California, a metro stop at the end of the downtown area provides easy access to downtown residents and in particular to the residents of town homes adjacent to the tracks, for commuting into San Francisco. I had clients last spring who were pleased that commuter tracks were near their neighborhood – in anticipation of the days when they would be able to catch an easy ride into downtown. Another friend broke his lease specifically because he didn’t realize the house he had rented was so close to the tracks that the trains kept waking him (and his dog!) up at night. Homeowners without children, or retired people may not be as concerned about access on to the tracks or a station, and may not be as deterred by the proximity, particularly if the neighborhood has other amenities. If you’d like some hard numbers on the impact of tracks to a neighborhood, you can read this article by Kevin Semanick from 2004. All of this begs the question, of course, about how much the tracks really affect, in hard dollars, the price or valuation of homes near the tracks. Specific information about a given home would need to come from an appraisal of the home in question. In general, the homes in a neighborhood with nearby tracks will show market value adjustments correlating to distance from the tracks. If all of the comps for a property being appraised are comparably impacted by the tracks (for simplicity’s sake, say, all in the same town home development, all facing the station), no additional adjustment should be necessary. For homes differently impacted, perhaps because one backs to the tracks but another is 4 blocks away, then additional scrutiny is necessary to evaluate the impact on value specifically attributable (due to) to the train tracks. Please, tell us what YOU think! Great post and photos as always. I think sometimes we have preconceived notions on what hurts AND helps values. It’s best to let the data do the talking, it may be totally different than what we thought. Good post. I like your new comment set-up, by the way. Lost a husband and two cats to cancer all in one year…..